You know how much I love trying new snack foods, particularly when traveling. On a trip to the UK, I discovered Hoots. Hoots are a "healthier alternative to traditional potato crisps". They are baked, not fried. They contain whole grains and seeds. No MSG. No artificial junk. Etc. Available in 5 flavors, including the basic sounding salt & vinegar and salt & pepper, slightly more interesting cheese & onion or pickled onion, and ... smoked bacon. You can guess which I went for. 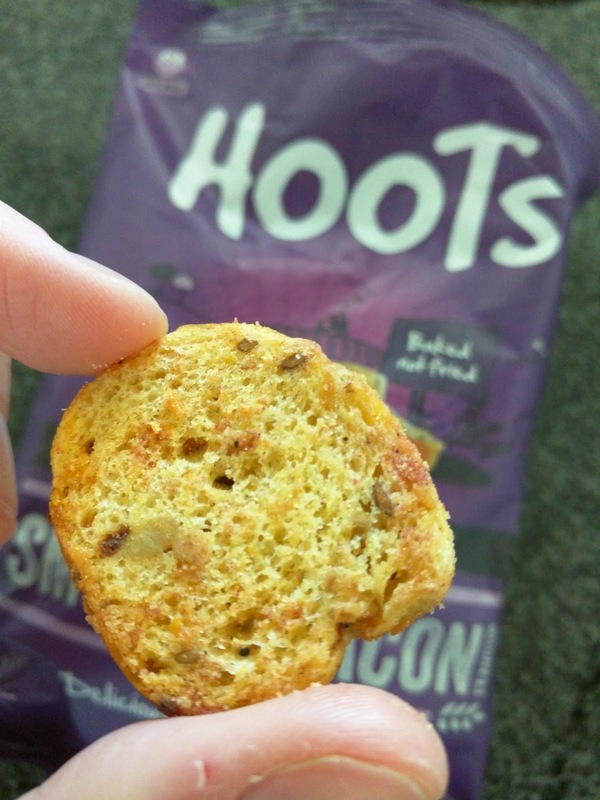 "Delicious bite-sized Hoots bursting with flavour and a mix of wholegrains and seeds for a more satisfying eat..."
These were really ... different. They were indeed somewhat wholesome, I could taste the seeds inside. I didn't taste bacon exactly, but they were quite savory, salty, and a bit addicting. The crunch factor was high, and more enjoyable to snack on than a chip. Like a cracker perhaps, but much more interesting? I oscillated between loving these and just being fascinated by them and not really liking them. I'm still not sure what side I ended up on. I think that means I'd try them again. For newer reviews, since my reviews of new flavors in 2014, 2015, and 2016. You already know that I love ice cream. I was raised eating ice cream after dinner pretty much every night. And going out to get soft serve regularly in the summer. Mmm, ice cream! I grew up in New Hampshire, right on the Vermont border. Vermont: otherwise known as "upside down New Hampshire", or, alternately, "home of Ben & Jerry's". This meant that while the rest of the country paid an absurd $5 per pint for their ice cream, we paid $2. 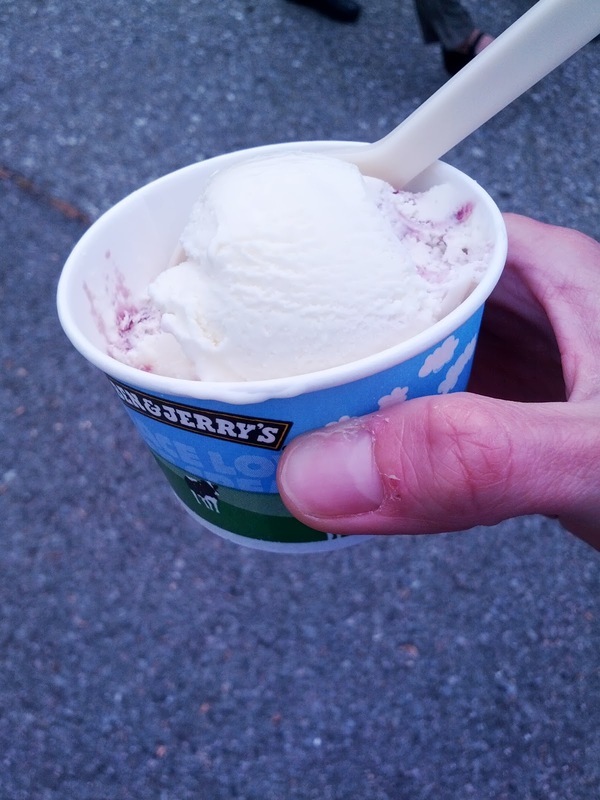 Ben & Jerry's wasn't fancy ice cream, it was commonplace. I ate of lot of it growing up. Fast forward to college. My college had a required meal program of 21 meals per week (3 meals per day, 7 days per week), that also included unlimited access per meal period in the regular dining halls, aka, you could go back in the dining hall for lunch 10 times in a single day if you wanted, and it just counted as 1 meal. We also had a diner and convenience store, where you could get prepared to order food, or stock up on "essentials" like chips, drinks, bulk candy, or ... pints of Ben & Jerry's. At the diner, items had prices and you had to use your meal "equivalency", it wasn't unlimited like the dining halls. My first year, I only ever used the equivalency when I went out to dinner, or ordered pizza, which happened a few times a month. I had a decent amount of ice cream (and candy!) as a result. But the next year, I discovered a bit of a glitch in the system. You could go to the diner, use your equivalency to get your pint of Ben & Jerry's and some candy, and then go the the dining hall. When you swiped your card at the dining hall, it would say that you'd already used your meal. Except ... we had the unlimited meal program, so it didn't matter. They'd just let you through. The system did not distinguish between using your meal in the dining hall or in the diner! This meant that every single day, I could get 2 pints of Ben & Jerry's. If you think I love freebies now, you should have seen me when I was a poor college student! Let's just say that I ate a rather insane amount of Ben & Jerry's before they "fixed the glitch". It wasn't abnormal for me to eat an entire pint in a single sitting. My favorites were Vanilla Heath Bar Crunch, Everything But The..., Chubby Hubby, and Chunky Monkey. Oh man, how I loved my pints of ice cream. Anyway, since college, I haven't really had much Ben & Jerry's, as there are better local ice cream shops around here, like Mr. & Mrs. Miscellaneous! And I still can't get over how expensive it is out here! But, a year or so ago, when dealing with medical issues, I had a period of time where I was on a liquid/soft foods only diet. Most of that time was also non-fat, which clearly ruled out Ben & Jerry's, but at one point, in order to run some tests, I had to radically increase my fat consumption, while still being mostly liquids. One thing immediately came to mind: Ben & Jerry's! I gleefully stocked my freezer and re-lived my college days. Since then, I've run into Ben & Jerry's a few more times, on flights (American Airlines serves sundaes in business class and Delta has it in economy), and at random events at work where Ben & Jerry's was brought in to cater. Ben & Jerry's isn't amazing, I mostly think it is pretty generic ice cream at this point, albeit with some creative flavors, and wouldn't go out of my way for it, but every once in a while, it really brings back such memories :) My review below is of tasting notes over the past two years, and doesn't include memories from earlier since I'm not sure those would be consistent with my present reality. You can read about new flavors from 2014 and 2015 in a separate post. "Sweet cream ice cream swirled with crunchy cinnamon cereal”. Peaches & Cream (Test Batch). "Creamy mascarpone ice cream with peach pieces". 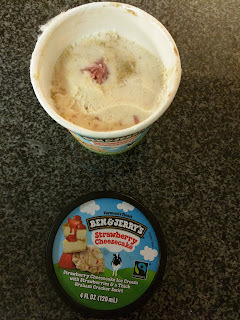 This was fairly light and fruity tasty, even though it was obviously a decadent Ben & Jerry's ice cream with mascarpone in it. The mascarpone flavor was noticeable and pretty good. I really loved the chunks of peaches in it. 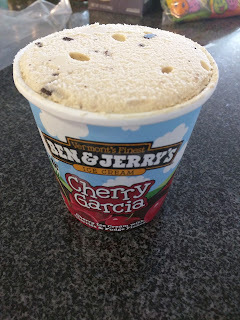 This was very different from most Ben & Jerry's flavors in that it wasn't loaded with candy, but I really liked it, and hope they continue it. "Chocolate Ice Cream with Gooey Marshmallow, Caramel Swirls & Fudge Fish". 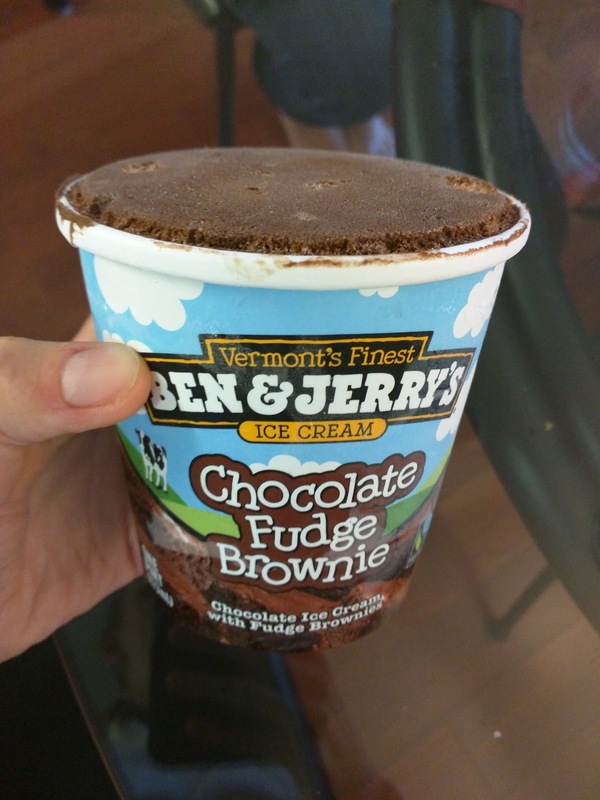 This has a pretty decent chocolate flavor, and I'm not generally one for chocolate ice creams. Very creamy, like all of their ice cream. Loaded with a swirl of sweet gooey marshmallow, plentiful dark chocolate fish, and some sweet caramel. Overall, a bit too sweet for my tastes. Previous Notes: Good creamy chocolate ice cream, tons of gooey marshmallow, tons of big dark chocolate fish. Not really my thing, but not bad. I would like nuts or something more interesting, and more of the marshmallow! "Vanilla Ice Cream with a Chocolate Cookie Swirl, Chocolate Chip & Chocolate Chocolate Chip Cookies". This was recommended to me by Ojan's niece. I thought it was going to just be cookies & cream or cookie dough. I wasn't really excited. I was wrong. This was a great flavor. 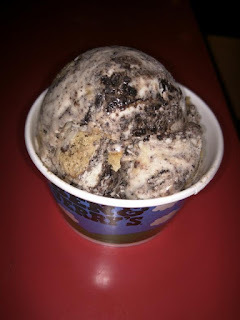 The "chocolate cookie swirl" was like mashed up Oreos, in a think band than ran throughout. It reminded me of the crunchy bits I love from Carvel ice cream cake. The chocolate chip cookies also weren't like globs of cookie dough, it was also a cookie swirl, full of flavor. 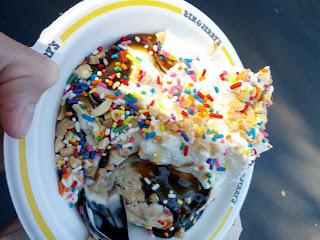 This flavor was just loaded up with tons of the cookie swirls, and was really quite good. I'd gladly have more! The ice cream base is a subtle, sweet cherry flavor. Good enough I guess, but not a flavor I'd ever pick. How many cherry ice creams are there in the world? Perhaps there is a reason for that. The chocolate chunks are great though, dark chocolate, large size chunks, and plenty of them. The cherries are my favorite component, sweet, bursts of flavor, and the semi-frozen texture is actually really enjoyable. Previous Notes: Plentiful dark chocolate chunks that have good chocolate flavor, lots of cherries, subtle cherry flavored ice cream but ... just not a big fan. 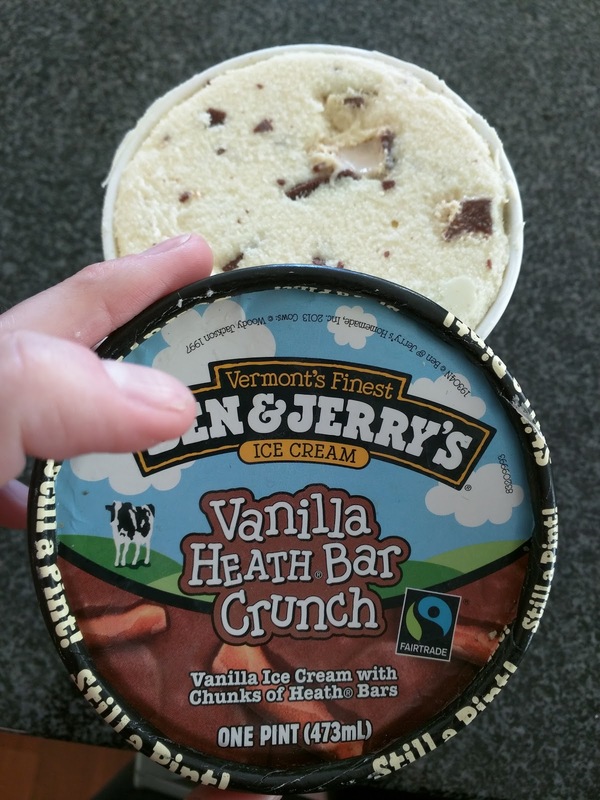 “Vanilla Ice Cream with Chunks of HEATH® Bar Crunch”. This is one of my old standbys. I can't tell you how many pints of Heath Bar Crunch I've had in my life. There is something about the gooey heath bars embedded in it that make me incapable of putting down a pint. I just always want "just one more"! This latest time, I thought the vanilla ice cream was pretty generic. I still loved the Health bars, but there were not many at all in it. Sadness. However, you can no longer buy Vanilla Heath Bar Crunch. It has been replaced with ... Vanilla "Toffee Bar" Crunch, since they no longer source the toffee bars from Heath, and have gone for a Fairtrade Certified and non-GMO producer instead. "Chocolate Ice Cream with Fudge Brownies". I'm not normally a chocolate ice cream fan, but I really liked this. The chocolate ice cream was creamy, and almost mousse like. It had a very intense chocolate flavor. It was crazy sweet however, definitely sweeter than I'd prefer. There were plentiful chunks of decent fudgy, chocolate brownies. Serious chocolate overload! This past summer, they did the greek yogurt tour again, driving the bus around from city to city, giving out free greek frozen yogurt. But this time, at the end of each city's time, they also introduced a one weekend only ice cream flavor to commemorate the city. To form the flavor, they put up a web site that listed a bunch of options, and had people vote on what would make the best flavor. And then vote to name it. And for one weekend, they gave out little samples. San Francisco's flavor was named ... San Fran-tastic. Ugh. I honestly have such a thing against people calling San Francisco "San Fran". Shutter. Anyway, it was a caramel ice cream base, with Kika's Treats chocolate covered graham crackers, marshmallow pieces, and TCHO chocolate. It was a nice touch to feature local artisans. If you don't know of them, TCHO has a chocolate factory located right on the Embarcadero that makes decent chocolate and offers fairly interesting free tours, and Kika's Treats makes a variety of cookie-like treats, and show up regularly at different artisan's markets. 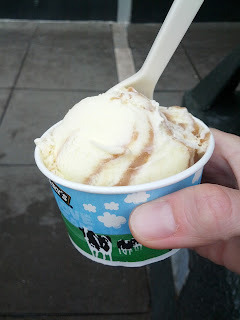 The caramel ice cream base was creamy and very sweet, but overall ok. My cup full did not contain any marshmallows nor pieces of TCHO, so I have no idea what they were like, in taste or form factor. I did have a full size chocolate covered graham cracker, which was really just kinda hard to eat as it was so big. It was also a bit bitter. I've had Kika's Treats many times over the past few years, and never found any of them to be bitter, so I'm not really sure what was up with that. Overall, this was not a winner, but I don't feel like I really got to experience it. And, sadly, it no longer exists, so I won't get to try it again. "Strawberry Cheesecake Ice Cream with Strawberries & a Thick Graham Cracker Swirl." I don't like strawberry ice cream, so I really didn't think I'd like this. And, well, I didn't really care for the strawberry ice cream base. It did have a slight cheesecake flavor to it, but, it was still strawberry. However ... I loved the graham cracker swirl. I liked it for all the same reasons I like their cookie dough: sweet, buttery, flavorful. The frozen chunks of strawberry were also rather fun, icy little blocks of flavor. Certainly not a flavor I'd pick, since I don't want strawberry base, but really quite good, and if you like strawberry ice cream, give it a try. Bonnaroo Buzz: “Toffee & Malt Ice Creams with Toffee Chunks & a Whiskey Caramel Swirl”. Tasting notes: Nice sweet toffee ice cream, generous chunks of toffee, pretty good! 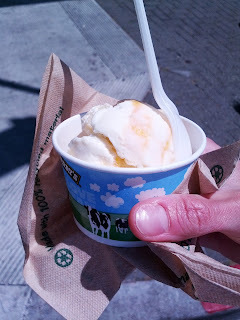 Butterscotch (2012 Test Batch): "Butterscotch ice cream with butterscotch swirls." Tasting notes: this was creamy and sweet, pretty much as you'd expect from a butterscotch. The swirls were like a punch in face, insanely intense. Almost boozy flavor, and had some chunks. Good, but a big bowl of this would be a bit much. Candy Bar Pie: "Peanut Butter Ice Cream with Fudge Flakes, Chocolate Nougat & Sweet & Salty Pretzel Swirls". Tasting notes: Wow, this really was like a candy bar pie! Peanut butter ice cream, full of peanut butter flavor. Loaded up with tons of candy. Really good, but very rich and heavy. Chunky Monkey: "Banana Ice Cream with Fudge Chunks & Walnuts". Tasting notes: decent banana flavor, goes well with fudge and walnuts. Coconut 7 Layer Bar: “Coconut ice cream with coconut & fudge flakes, walnuts & swirls of graham cracker & butterscotch”. Tasting notes: You’d think I’d love this, but it was just sweet and had way too much coconut flake. Not creamy at all. Gilly's Catastrophic Crunch™: "Chocolate & sweet cream ice creams with caramel clusters, fudge-covered almonds & a marshmallow swirl." Tasting notes: The chocolate ice cream was all I really tasted. It didn't have as much marshmallow swirl as Phish Food. Meh. Late Night Snack: "Vanilla Bean Ice Cream with a Salty Caramel Swirl & Fudge Covered Potato Chip Clusters". Tasting notes: The ice cream was not creamy nor flavorful. Did not have any salty caramel swirl. The chocolate covered potato chip clusters were horrible - soggy, not salty, just weird chunks of stuff. Lazy Sunday™: "Vanilla cake batter ice cream with chocolate & yellow cupcake pieces & a chocolate frosting swirl." Tasting Notes: I didn't taste cake batter, just a slightly sweet base. Nor did I find distinct pieces of cake, just a strange texture which I assume was a result of the cake. Meh. 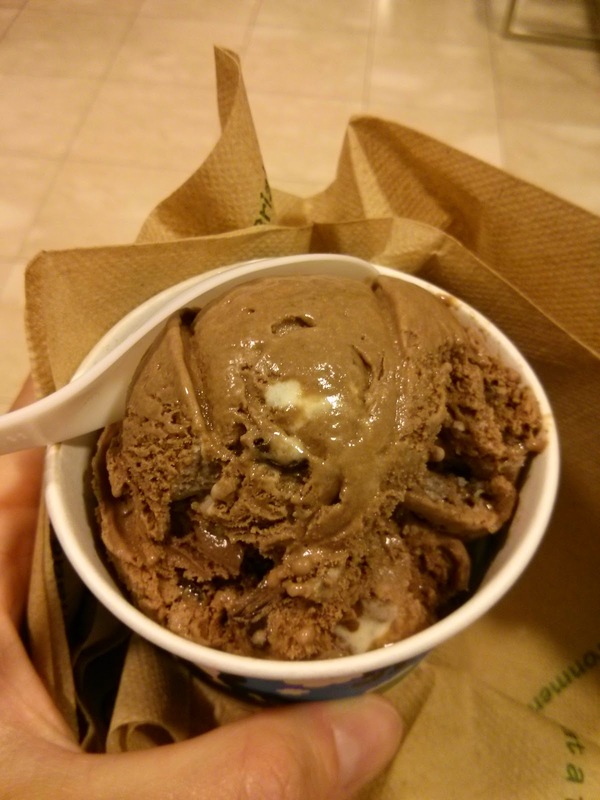 Mint Chocolate Chunk: “Mint Ice Cream with Fudge Chunks”. Tasting notes: Decently minty, tons of huge chocolate chunks. New York Super Fudge Chunk: “Chocolate Ice Cream with White & Dark Fudge Chunks, Pecans, Walnuts & Fudge Covered Almonds”. Tasting notes: Generic chocolate ice cream, nice big chunks of sweet white chocolate and chocolate, lots of walnuts. I didn’t find any pecans. Fudge covered nuts a little mushy. Lots of stuff in it. Rocky Roadish: “Toasted Marshmallow Ice Cream with a Toasted Marshmallow Swirl & Fudge Covered Almonds”. Tasting notes: Nice gooey marshmallow, but meh almonds. Salted Caramel (Test Batch, Scoop Shop Exclusive): "Salted caramel ice cream with a salted caramel swirl." Tasting notes: Sweet, but not overkill. Creamy. Nice caramel swirl. But didn't really taste any salt. Schweddy balls: “Vanilla ice cream with a hint of rum and is loaded with fudge covered rum and milk chocolate malt balls.” Tasting notes: Not very creamy, no real rum flavor, cheap malt balls. Turtle Cheesecake: "Cheesecake ice cream with pecans, fudge flakes & a caramel swirl". Tasting notes: I wanted to love this, since the ingredients sounded like winners, but it was just way too sweet for me. I also didn't really taste cheesecake. They also now offer soft serve, which I was excited by, as I grew up eating tons of soft serve, and haven't really been able to find any in the Bay Area, as all of soft stuff tends to be frozen yogurt here. Unfortunately, I was not impressed by Ben & Jerry's offerings. Chocolate: Decent chocolate flavor, but not great consistency, which is surprising for ice cream rather than soft serve frozen yogurt. Vanilla: No flavor, poor consistency, kinda icy. Swirl: Not creamy, kinda icy, not very good flavor, just not very good. 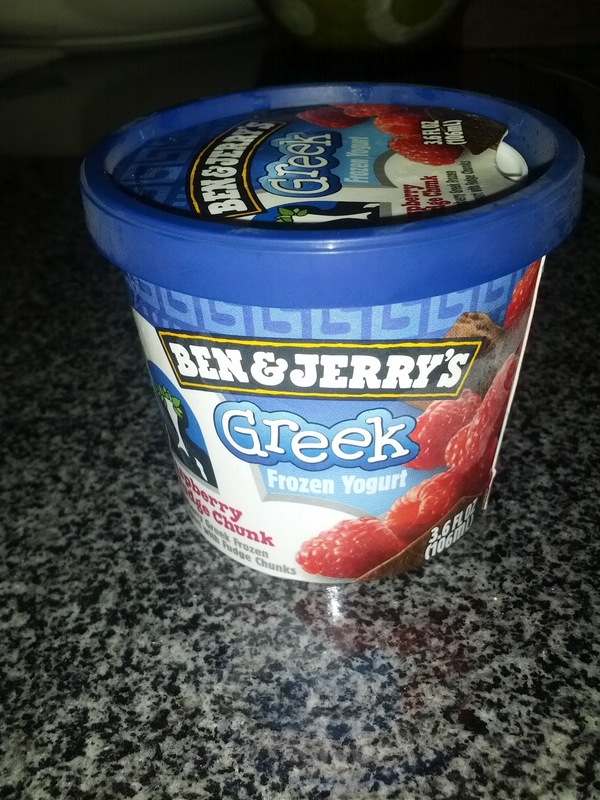 Raspberry Fudge Chunk Greek Frozen Yogurt. "Raspberry Greek Frozen Yogurt with Fudge Chunks". Pineapple Passionfruit Greek Frozen Yogurt. 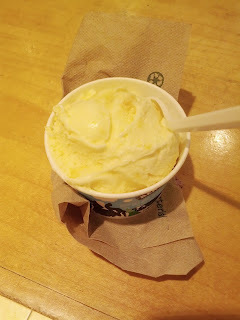 "Pineapple Greek Frozen Yogurt with Chunks of Pineapple & a Passionfruit Swirl". The chunks of pineapple were flavorful and refreshing. The passionfruit swirl was sweet but not overbearing. The whole thing was tropical and balanced. Again, creamy for a yogurt. I'd get this again! "Lemon Greek Frozen Yogurt with a Blueberry Lavender Swirl". Like most of their frozen yogurt, it was not very creamy. I wouldn't have known it was lemon flavored, just sorta tart. The swirl was colorful and vibrant, but had no flavor. 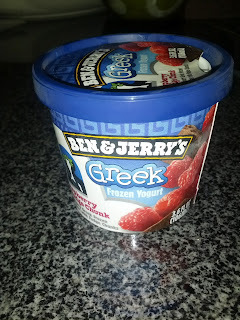 Least favorite frozen yogurt I tried. They've also had several regular frozen yogurts in their product line for a while. Why would you ever pick them though? Their crazy premium decadent ice cream is what they are good at! Half Baked Frozen Yogurt: "Chocolate & Vanilla Low Fat Frozen Yogurts with Fudgey Brownies & Chocolate Chip Cookie Dough". Tasting notes: not good, bad consistency and flavor. Ben & Jerry's catered an ice cream party at my office. They had a couple types of ice cream to select from, and then a bunch of toppings. I loaded this thing up. 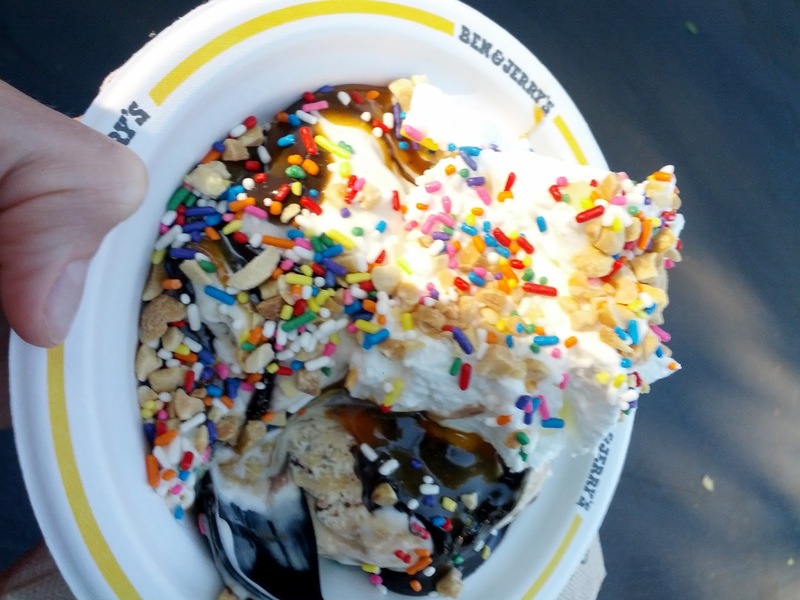 It was an amazing sundae! Hot Fudge: very chocolately, great on sundae, nice and thick. Caramel: great flavor, sweet, nice. Whipped Cream: Fairly standard, but good. Nuts: just little crushed peanuts, but help complete a sundae. As you read about last week, I recently had a layover at the Philadelphia Airport, my first time there. The timing of my flights was awkward, and I was flying economy, so I didn't have any meals provided. Thus I needed to eat meals at strange times, spread out between the airports plus snacks on my flights. I landed in Philadelphia in the far out terminal F, which requires a shuttle over to the other terminals, where of course I was departing. Being diligent, I knew that the other terminals had Pinkberry, which I've reviewed many times before, but F had Red Mango. I hadn't been to a Red Mango in years, so I was eager to check it out, and even though it made no sense to have froyo the moment I landed, well, that is what I did. While it was different from what I remembered, it still made me very happy. After my arrival froyo, I headed to the B/C Connector terminal, to grab food to consume on my flight for dinner a few hours later. Standard food court choices of Subway, Au Bon Pain, etc were what most people would go for, I'm sure. But there was also a formal sit down Legal Seafood. Now, I've never loved Legal, even though I've tried it several times, but I assumed it would be better than random fast food airport food. Of course, most of what is appealing on Legal's menu is hot food, but it didn't make sense to get crab cakes, grilled scallops, or fish and chips to eat later. So, I went simple: salad and dessert. Even though located in an airport, the restaurant is mainly for dine-in. I guess most people don't have the thoughts I do. They didn't even have an area to order takeout, nor a takeout menu posted, but I knew I could do it, and ordered from the hostess. Since my selections didn't require much prep, they were ready within just a few minutes, and handed over nicely packaged up, with dressing and sauces on the side. Even if not advertised, they obviously know how to do takeout. The food was ... fine. About what I expected. No more, no less. If you need something in the airport, it isn't the worse option, but it certainly isn't worth going out of your way for. Next time, I'd just eat MORE Red Mango! Classic Caesar Salad. $7.95 + Maine Crabmeat $10. "Romaine hearts, garlic croutons, shaved romano, creamy dressing." Since I needed something to eat for a later meal, my options for cold food were fairly limited, and I settled on just a salad. Greek, Wedge, House, or Caesar were the options. Of those, Caesar sounded by far the best. To any salad you can add grilled chicken, shrimp, or salmon, or ... crab! Being a crab lover, I opted for that without hesitation. I figured I needed some protein. This wasn't the smartest idea in retrospect ... I wasn't planning to eat for a few hours ... crab sitting out for a few hours ... whoops! The salad was ... fine. Standard romaine lettuce chunks, fresh enough. The lettuce wasn't brown, it wasn't soggy, it wasn't wilted. So, fine. The croutons were huge, and super buttery, which was kinda nice. I didn't actually taste garlic, thus, I wouldn't call them "garlic croutons" as advertised. The dressing was standard creamy Caesar. It didn't probably have any anchovy in it, but it did have plenty of cheese. As for the "shaved romano"? Besides the cheese in the dressing, there was no other cheese in the salad. No shaved, not shredded, not grated. Overall, a pretty standard Caesar salad. Nothing notable, nothing awful. Probably better than the fast food, and a decent size for $7.95. The add-on crab was scooped into the middle. It was also decent. 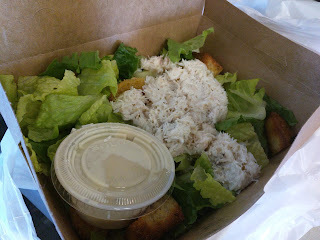 A huge portion, which seemed generous at first, until I considered the fact that it was $10, more than the salad itself. It was however all shredded crab, no lump meat. It wasn't fishy or off-putting, and it was slightly sweet. It was well seasoned with salt and pepper, and I kinda think it had a little mayo mixed in. Again, good enough. Ojan and I enjoyed the salad, particularly compared to our other options, but it was certainly not an earth shattering salad. "Chocolate sauce, rum caramel sauce, toffee almond crunch." Of course, you know me, I needed dessert. There were three choices, starting with Key Lime Pie, which I'm never a fan of. Next was cheesecake, which I had been craving like crazy, but had the night before at the Aloft hotel bar, and a few days prior at the Romano's Macaroni Grill in the O'Hare Airport. Finally, their classic dessert, since they are a New England based chain: Boston Cream Pie. Plus, Ojan was with me. I didn't exactly have any choice besides the Boston Cream! I'm not sure I've ever actually had the Boston Cream pie from Legal Seafood. I don't think I've had ... any dessert there actually. The Boston Cream is a signature dish however, and they even sell it on the website for home delivery. For the unfamiliar, Boston Cream Pie is not, actually, a pie. Or what you likely think of as a pie. Closer to cake than pie. They always take a slightly different form, but are all composed of the traditional elements of custard, vanilla cake, and chocolate. 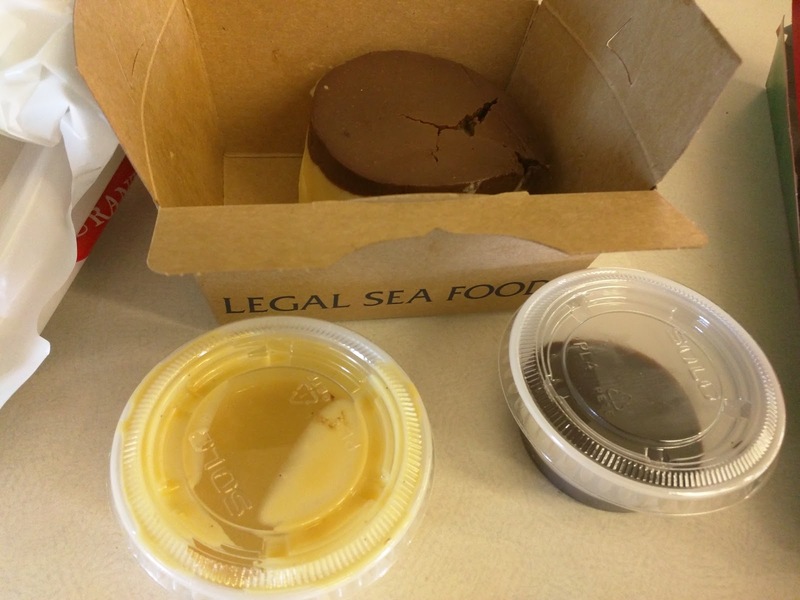 The Legal Seafood version is an individual round portion. Starting at the bottom is basic yellow sponge cake, a thin slice. On top of that an equally thin layer of the custard. Then another same size layer of sponge cake. Eventually, a thicker layer of custard. All topped off with a chocolate fudge layer, again, about the same size as the earlier custard and cakes. It was good. Again, like the salad, not earth shattering, but not bad. First, the cake layers. Now, I don't really like cake, and would rather not even include it in Boston Cream Pie. Everyone knows the pie is all about the creamy custard, right? It was ... cake. Plain cake. Meh. Next, the most important part: the custard. It was sweet, creamy, vanilla bean flavored. Basically just a thicker pudding. Certainly good enough. The chocolate on top surprised me. A thick fudge-like layer. Really nice milk chocolate flavor. Far, far better than I expected, and much better than the standard chocolate sauce many places use. Speaking of chocolate sauce. It also came with two sauces, each packaged up in their own little containers. The chocolate sauce was super thick, darker than the one on top of the pie. I didn't actually like it very much. Not that anything was wrong with it, but it was far too thick to drizzle over and the flavor was unremarkable. As for the second sauce ... I wasn't sure what it was. I tasted it, and it seemed like a basic vanilla creme anglaise, although a bit boozy. But then I looked up the menu online after and saw that it said it was a "rum caramel sauce"? Then again, the menu also said that it came with a "toffee almond crunch", which most certainly was not present here. The second sauce was sweet, but it certainly wasn't anything I'd call a caramel. Unlike the chocolate, it was thin, and easy to pour, although I ended up just using my spoon and eating it that way, separate from my pie. I did taste some slight booze, so perhaps it was rum. But definitely not caramel. When I look at images online, I see that it is normally served with the chocolate sauce drizzled over the top, on top of a pool of the other sauce, with an almond crunch over the top. They clearly just left that final component out of my togo order. Overall, it was fine, and I enjoyed it with a coffee on my flight. Not the best I've had, not the worst. Price of $7.95 was fine for a full size restaurant dessert.